City’s 1888 arrangement with Mr. Claude Vautin to build a smelting works had not been completed. Mr. Vautin’s deposit of $5,000 was declared forfeit and property of the City. The Council met on Monday December 30th 1889. Present His Worship, the Mayor and Aldermen Brewer, Brighouse, Clark, Horne, McConnell, Oppenheimer and Whetham. From Wm. Clements asking Council to allow a transfer of his salon license, such communication being accompanied by a petition signed by the residents west of Cambie St. Referred to City Solicitor. From Miss Bowes, furnishing the Mayor and Aldermen with copies of “Home Cheer”. Filed. From Henry A. Mellon requesting that a dangerous tree be cut down on Cordero Street. Referred to the City Engineer. From J. J. Blake informing the Council that Page Ponsford had not a good cause of action against the City. Filed. From Saul & Waite claiming payment of an account for Street filling. Referred to Board of Works. From J. C. McLagan informing Council that the letter press copies of the City Charter printed in New Westminster were burnt. Referred to Finance. 2. That the Petition from the Board of Trade re the Survey of False Creek be recommended to the favourable consideration of the new Council. 3. That J. J. Blake be appointed Counsel to represent the City at New Westminster in the case of McHugh vs. the City and that he be paid $25.00 for services already rendered in connection with this case. Although the Finance Committee is of the opinion that Mr. John’s Devine is not entitled to anything for a special Audit, it being considered part of his duty to furnish Special Audits when required, we recommend notwithstanding that the sum of $20.00 be paid into Court in full satisfaction of his claim of $60.00 against the City. 6. That the Report of the Board of Works be adopted. 7. That the Bank of British Columbia in this City be requested to place to the credit of the City of Vancouver the sum of $5,000.00 deposited as a forfeit by one Claude Vautin in said Bank and to be forfeited to the City of Vancouver if said Claude Vautin or a company to be formed by him for the purpose of erecting smelting works in this City should fail to comply with the terms of an Agreement between said Claude Vautin and the City of Vancouver dated the 28th Feb 1888 and signed by said Vautin on the 26th March 1888 and said Agreement not having been carried out the said sum of $5,000.00 has been and is forfeited and the property of the City of Vancouver. Resolved that a copy of this resolution be sent to the Bank of B.C. and to Wm. Prentice the resident Secretary of the Company mentioned in said Agreement. Further resolved that the bonus of $25,000 tendered to said company under certain terms and conditions which have not been fulfilled, be cancelled. Moved by Alderman Salsbury, seconded by Alderman Brighouse. That the Report of the Finance Committee be adopted. Carried. The Park Commissioners met on Thursday December 26th 1889. Present Messrs Alexander, Horne and McConnell. That the Council be requested to place a sufficient sum in the Estimates next year for the construction of a foot bridge to Deadman’s Island and for the opening up of trails throughout Stanley Park and for the completion of the lake. Resolved. That a block of land described as follows be cleared in the Hastings Park. Commencing at a point on the North West corner of the Park, thence South ten chains thence east 14 chains, thence North to the Railway track, thence west to the point of commencement as shown on the plan attached, containing about 14 acres more or less; and be it further resolved that the Board of Works be instructed to call for tenders and have this work carried out. Resolved. That the Council be requested at its next meeting to introduce a By-Law to provide for the election of Park Commissioners for the year 1890 as authorized by the City Charter. Moved by Alderman Brewer, seconded by Alderman Oppenheimer. That the report of the Park Commissioners be adopted. Carried. The Board of Works met on Thursday December 26th 1889. Present Aldermen Brewer, McConnell, Horne and Oppenheimer, Alderman Horne in the Chair. 2. That the City Engineer be instructed to notify the contractor on Robson Street grading to proceed at once with the execution of the work, same being of an urgent nature. 3. That the sidewalk on Haro Street be continued from Mr. Bowell’s house to the corner of Jervis Street; that a crossing be put down on the corner of Hastings & Gore, that Prior Street be gravelled and that the City Engineer be authorized to clear Hastings Street to the Eastern Park of fallen trees at a cost not to exceed ten dollars. 4. That H. F. Keefer be awarded the contract for the construction of the Sewers, his being the lowest tender $19,684.47. Moved by Alderman Brewer, seconded by Alderman McConnell. That the report of the Board of Works be adopted. Carried. The Annual Reports of the Finance Committee, Fire, Water & Light Committee and the Health Inspector were furnished by the respective chairmen thereof and were read and filed. Moved by Alderman Horne, seconded by Alderman Brewer. That the City Engineer be instructed to have any tree cut down if found dangerous. Carried. Moved by Alderman Horne, seconded by Alderman Salsbury. That His Worship, the Mayor be authorized to sign the lease and agreement with the Brockton Point Athletic Club as published in the paper and subsequently amended by resolution. Carried. Moved by Alderman McConnell, seconded by Alderman Brewer. That a vote of thanks be tendered Miss Bowes for copies of “Home Cheer” furnished the Mayor and Aldermen. Carried. The Annual Report of the Chairman of the Finance Committee was ordered to be published in the papers when completed to the end of the year. Mayor and Aldermen called to County Court in New Westminster to answer charges filed by Mr. John Devine, former City Auditor. Finance Committee deplores Mr. Devine’s breach of confidentiality in bringing financial irregularities before the public. The Council met on Monday December 23rd 1889. Present His Worship, the Mayor and Aldermen Brewer, Brighouse, Clark, Costello, Horne, McConnell and Whetham. From J. J. Blake notifying Council that it would be necessary to provide Council for arguing the legal questions arising in the case of McHugh as the City of Vancouver. Referred to the Finance Committee. From J. W. McFarland Secy V. W. W. Co. acknowledging receipt of communications re hydrants on Princess St. Filed. From Geo. S. Bodington Eng. M.D. asking payment of his fee for Affidavit re Small pox on the S. S. Premier. Referred to Finance Committee. From A. H. B. MacGowan, Secretary of the School Trustees asking that a sidewalk be layed on Robson or Smithe Streets between Granville and Burrard Streets. Referred to the Board of Works. From A. H. B. MacGowan Secretary of the Board of Trade asking the Council to set aside a sum of money say $1,000.00 to make a survey of False Creek to be furnished to the Department of Public Works for the improvement of the Navigation of said Creek. Referred to the Finance Committee. From C. Warwick Dep. Register of the Court summoning the Mayor and Aldermen to appear at a County Court to behold on at New Westminster on the 5th day of February 1890 at the hour of 11 o’clock A. M. to answer a claim preferred by John Devine. Referred to the City Solicitor. The Finance Committee met on Friday December 20th 1889. 1. That the Report of the late City Auditor, Mr. John Devine, was fully considered and it was decided by the Committee that the complaints therein contained were trivial and generally unworthy of notice. Most of it all of the points referred to have been thoroughly placed before the public during the recent campaign and it is therefore not necessary to mention them again in detail. The Committee regrets that a confidential officer, like the City Auditor should have so abused his trust as to make public details of irregularities however slight which he was specially appointed by this Committee to discover and report to them for their guidance in dealing with the City officials having charge of the accounts and before having made himself fully acquainted with all particulars pertaining thereto. Solicitor for his opinion thereon. 4. That the item of $170.00 in the Report of the F. W. & L. Committee be allowed to stand over. Moved by Alderman Costello, seconded by Alderman McConnell. That the Report of the Finance Committee be adopted. Carried. The lease to the Brockton Point Athletic Club was read over clause by clause. Moved by Alderman Horne, seconded by Alderman Clark. That the Council approve of the lease for the Brockton Point Athletic Club with the exception of the clause relating to the time, which is limited to 40 years and the clause relating to the admittance fee which is amending by adding “that children under 12 years be admitted free at half price; such lease to be printed for one week. Carried. be instructed to pay the City Officials at the end of the present month instead of on the first of the year in order to close out the account for 1889. Carried. Moved by Alderman McConnell, seconded by Alderman Brewer. That John H. Grady, Thomas Crawford and Joseph Gibson be paid at the end of the present month for services as special constables for the respective number of days which they have worked since appointment such time to be furnished by the Sergeant of Police, such officials to be paid at the rate of 60.00 per month. Carried. Alderman Salsbury gave notice that he would introduce a motion at the next meeting of Council in reference to the smelting works. Formation of a Battalion of Volunteer Militia and one or two Batteries of Garrison Artillery in the City of Vancouver was approved. Decision of last Council meeting to pay former City Solicitor John Devine’s final account was reversed. The Council met on Monday December 16th 1889. Present His Worship, the Mayor and Aldermen Brighouse, Clark, Costello, Horne, Mason, McConnell, Oppenheimer, Salsbury and Whetham. From N. Smith et al asking that the sidewalk on Burrard Street be extended one block to Nelson Street. Referred to the Board of Works. From Corbould, McCall & Jenns notifying Council that they were instructed by Mr. Page Ponsford to prosecute a claim for damages for injuries sustained by him for falling off the sidewalk. Referred to Finance Committee. From H. Abbott refusing to recognize any contract for taking gravel from a pit along the North Arm Road. Referred to the Board of Works. The Fire, Water & Light Committee met on Saturday December 14, 1889, a full Board being present. 2. That Alexander Montgomery be appointed a permanent fireman in place of Louis Eggert discharged. 3. That $170.00 be placed to the credit of the Fire Department to be expended in the purchase of the necessary requirements suggested by the Chief. 4. That the License Inspector be instructed to locate the cab and express stands on Carrall, Abbott and Cambie Streets and to require such conveyances to stand one behind the other instead abreast. Moved by Alderman McConnell, seconded by Alderman Oppenheimer. That the report of the F. W. & L. Committee be adopted. Carried. The Finance Committee met on Friday December 13th 1889. Present His Worship, the Mayor and Aldermen Salsbury, Clark, Costello and Whetham. 2. That John Boultbee be paid $125.00 in full settlement of his account for services connected with the police investigation. 3. That Messrs Drake Jackson & Co. be paid $97.50 for services in connection with the police investigation and advice on Water Works etc. 4. That John Devine be allowed the legal witness fees per day for attending the police investigation but that he be not paid for his special audit as same is covered by his regular monthly salary. 5. That Havelock Fyfe be paid to date notice of discharge in full settlement of his account against the city for services as police officer. 6. That John M. Stewart be allowed salary to date of notice of discharge but that all amounts due the City from him be deducted therefrom. Moved by Alderman Costello, seconded by Alderman Mason. That the Report of the Finance Committee be adopted. Carried. The Board of Works met on Monday Dec 16th 1889. Present Aldermen Brighouse, Oppenheimer, McConnell & Horne. 2. That the report of E. Mohun, Sanitary Engineer on the Sewer pipes received be adopted and that he be paid $300.00 on account of commission. 3. That the following tenders be accepted. Dunsmuir St. Box drain, McDonald & B.
Burrard St. Box drain, Mcdonald & B.
Corduroying North Arm Road, Connacher & A. Moved by Alderman Whetham, seconded by Alderman Costello. That the report of the Board of Works be adopted. Carried. Moved by Alderman Oppenheimer, seconded by Alderman Whetham. That a copy of the list of lights as per report No 21 be forwarded by the City Clerk to the Secretary of the Electric Light Co. Carried. Moved by Alderman Salsbury, seconded by Alderman Clark. That the motion of last Council passing sundry accounts for payment be rescinded as far as relates to Mr. John Devine’s account subsequently disallowed by the Finance Committee. Carried. Moved by Alderman Salsbury, seconded by Alderman Oppenheimer. Whereas the City of Vancouver has a large number of able bodied young men anxious to enlist as Volunteers in the interests of the Empire, the Dominion of Canada, the Province of British Columbia and of the City of Vancouver. That the Honourable the Minister of Militia and Defence, be respectfully requested to authorize the immediate organization and establishment of a Battalion of Volunteer Militia and one or two Batteries of Garrison Artillery in the City of Vancouver. And be it further resolved that a copy of this resolution be forwarded to the Honourable the Minister of Militia and Defence, by the City Clerk. City slaughter houses given six months’ notice to re-locate outside city boundaries. J. T. Abray & W. D. Haywood resign as police officers. J.J. Blake resigns as city solicitor. All vacant lots to be fenced by owner; otherwise city will construct fences and bill the owners. The Council met on Wednesday December 11th 1889 for general business. Present His Worship, the Mayor Oppenheimer and Aldermen Brighouse, Brewer, Clark, Costello, Horne, Mason, McConnell, Oppenheimer, Salsbury and Whetham. The Minutes of last regular and special meetings were read and adopted. From Joseph Couture asking payment of $28.00 for permanent improvements on Howe Street. Filed. From E. W. Griffith et al asking that the lane in rear of the East end School be improved. Referred to the Board of Works. From J. M. Browning, C. P. R. Land Commissioner granting the City the temporary use of a piece of land at the South end of Abbott Street. Filed. From I. B. Godfrey et al requesting that the sidewalk on Melville Street be made six feet wide instead of two. Filed. From J. J. Blake, City Solicitor advising Council that J. M. Stewart and H. Fyfe were not entitled to any salary after suspension. Referred to Finance Committee. granting the City an extension of time for the erection of the fountain. Filed. From Chas. Wm. Robson asking permission to erect a stable in rear of the Hudson’s Bay Co’s Store. Referred to the Board of Works. From Joseph Huntly re: the fencing lots where there are high sidewalks. Filed. From John Devine re Auditors Report. Referred to Finance Committee. From John Devine re resignation. Filed. From D. B. Murray re gravelling North Arm Road. Referred to Board of Works. From F. W. Sentell et al requesting that Thurlow Street be graded. Referred to Board of Works. From S. Minard re purchase of team for the Fire Department. Referred to F. W. & L. Committee. From A. E. Beck re location of poles for Arc Electric Lights. Referred to F. W. & L. Committee. From J. T. Abray & W. D. Haywood resigning as Police Officers. Filed. From J. J. Blake resigning as City Solicitor. Filed. From J. G. McDonald asking payment for work done on City Wharf. Referred to Board of Works. From A. J. Monat Secy Treas of Free Reading Room furnishing his monthly report. Filed. The Finance Committee met on Friday November 22nd 1889. Present His Worship the Mayor and Aldermen Clark, Costello and Whetham. 2. That a communication be addressed to John M. Browning, Land Commissioner asking him to allow the question of the erection of the fountain to stand over until next year. 3. That Joseph Gonsales be paid $361.00 as agreed upon with his Solicitor to remunerate him for burning his household effects etc. by order of the Health Inspector, such amount to include the amount already passed for him by the Health Committee in January 1889. 4. That Dr. Bodington be informed that the Council cannot see its way clear to allow him any remuneration for the affidavit re small pox on the S. S. Premier. Moved by Alderman Clark, seconded by Alderman Brewer. That the Finance Report be adopted. Carried. The Board of Health met on Wednesday Dec. 4, 1889. Aldermen Costello, Whetham and Salsbury. 2. That the Board of Works be requested to at once proceed with the construction of the deep surface drainage system for carrying off the stagnant water throughout the City as previously recommended by this Board and endorsed by the Board of Works. 3. That the owners of all slaughter houses within the City limits be given six months’ notice to remove such houses to some point outside the limits of the City. 4. That the Health Inspector be authorized to connect any and all restaurants and hotels with the public sewers under the provisions of the public health By-Law and amending By-Laws where practicable. Moved by Alderman Oppenheimer, seconded by Alderman Costello. That the Report of the Board of Health be adopted. Carried. The Board of Works met on Thursday November 21st and Thursday Nov 28th 1889. Present Aldermen Brighouse, McConnell and Horne. a sidewalk on Howe Street with old plank from the streets also that L. R. Johnsons be allowed to lay sidewalks on Pacific Street and Beach Avenue with the same material if obtainable. 2. That tenders be called for the gravelling of the North Arm Road from Granville Street Bridge South to the Boundary line of the City; one tender to be for gravel taken from the North Arm Road, the other for gravel brought in by scows. 3. That John Johnson be permitted to lift sidewalk in front of his lot for the purpose of filling in same, subject to the terms of the By-Law governing same. 4. That D. B. Murray’s foreman be allowed $3.00 per day in connection with the filling in of Westminster Av and that D. B. Murray be allowed 15 per cent on the total cost of such filling. 6. That a box drain be dug and a box culvert put in on Burrard Street between Eveleigh Street and the hill to the South of the school house on Barclay Street also that a drain and box culvert be put down on Dunsmuir Street from Cambie to Robson Street or as for as necessary and that tenders be called for the same. 9. That D. B. Murray’s tender be accepted for the gravelling of the North Arm Road South of Granville Street Bridge and that said tender be forwarded to Mr. H. Abbott together with an Estimate of the total cost of the work. 10. That Messrs Sansom and Dawson be permitted to erect a balcony on the lane at the corner of Pender and Howe Streets provided it does not conflict with existing by-laws. Moved by Alderman McConnell, seconded by Alderman Horne. That the Board of Works Report be adopted. Carried. Moved by Alderman Brighouse, seconded by Alderman Brewer. That the lane in rear of the Leland House be planked with old plank if obtainable, such plank to be laid by the applicants. Carried. Moved by Alderman Oppenheimer, seconded by Alderman Horne. That a six ft. sidewalk be laid on Melville Street instead of 2 feet. Carried. Moved by Alderman McConnell, seconded by Alderman Brewer. That the tender of Wm. Murphy be accepted for the furnishing of the requisite number of police uniforms according to Sample No One, Price per Suit $55.00 and that D. Evans be given the contract for the requisite number of overcoats at $30.00 each. Carried. Moved by Alderman Horne, seconded by Alderman Salsbury. That the resignation of J. J. Blake, City Solicitor be accepted. Carried. Moved by Alderman Oppenheimer, seconded by Alderman Mason. That Arc Lights not to exceed 90, be contacted for and located in places to be fixed by the Fire, Water and Light Committee such selection to be approved of by Council. Carried. No 88, that are not fenced after reasonable notice in writing has been given to the owners thereof, either personally or through their reputed agents, be fenced at as reasonable cost as possible by the Board of Works of this City and the cost of so doing be collected in manner prescribed in said By-Law No 88. Carried. Moved by Alderman Oppenheimer, seconded by Alderman Brighouse. That the sum of $28.00 be paid to Joseph Couture for permanent improvements at the corner of Howe and Dusmuir Streets. Carried. Moved by Alderman Mason, seconded by Alderman Costello. That the sidewalk on Quebec Street between 14th & 15th Avenues be placed on the west side of the street. Carried. Moved by Alderman Brighouse, seconded by Alderman Whetham. That the City Engineer be instructed to prepare specifications for corduroying the low swamp and other bad portions of the road to the City Cemetery with split cedar material corduroy to be Sixteen feet wide and that tenders be called returnable on Monday next at noon. Carried. Moved by Alderman McConnell, seconded by Alderman Brewer. That the Sgt of Police be authorized to appoint two special police constables temporarily. Carried. Moved by Alderman McConnell, seconded by Alderman Brewer. That the resignations of officers Abray and Haywood be accepted. Carried. Moved by Alderman Salsbury, seconded by Alderman Horne. That the City Clerk advertise for applications for the position of City Auditor, the time for the reception of such applications being limited to two weeks. Carried. Moved by Alderman Costello, seconded by Alderman Horne. That I. B. Spring be allowed old plank enough to lay a two ft. sidewalk in the lane in Block 5, 196, length 100 ft. or less. Carried. Moved by Alderman Horne, seconded by Alderman Salsbury. That the offer of J. M. Browning, C. P. R. Land Commissioner re leasing the piece of land from the C. P. R. Co. for the storage of the sewer pipes be accepted, as per his letter dated Nov 20 1889. Carried. Special meeting to reconsider the awarding of the sewer contract. Decision postponed until a meeting with the sanitary engineer. A Special Meeting of the Council was held on Thursday November 21st 1889 to reconsider the awarding of the Sewer contract. Present His Worship, the Mayor and Aldermen Brighouse, Clark, Horne, Mason, Oppenheimer and Whetham. After talking the matter over it was decided to adjourn until Friday at 3 o’clock so that the Sanitary Engineer could be present. Board of Works recommends (and Finance Committee opposes) purchase of a fountain from New York at a cost of $763.00 Fire Brigade staff to be fined $2.50 for a first offense, $5.00 for a second offense, and dismissed for a third offense of: (1) Disobedience of Orders (2) Being in a State of Intoxication (3) Insolence in word or manner (4) Violent or coarse language or behaviour (5) Entering hotels or saloons while on duty or houses of ill fame, unless in the discharge of duty as a fireman. The Council met on Monday November 18th 1889. Present His Worship, Mayor Oppenheimer and Aldermen Brewer, Clark, Costello, Horne, Mason, McConnell and Whetham. The Minutes of last meeting were read and adopted. From Johnny Fort Rupert applying for moiety in case of one Wm. Cook. Referred to Finance. From Geo. F. Bodington, MD. rendering an account for $10.00. Referred to Finance. From H. Abbott, agreeing to pay half the cost of gravelling and repairing the North Arm Road South of Granville St. Referred to Board of Works. From E. H. Fletcher, P. O. Inspector, asking permission to locate certain P. O. Boxes. Filed. From H. B. Gilmour et al asking for sidewalks on Nelson St. Referred to the Board of Works. From Wm. Prentice, Local Secretary of the British Columbia Smelting Co. acknowledging the receipt of communication re Starting of Smelter. Referred to Finance Committee. From John McLaren, Sgt of Police asking for winter uniforms for the force. Filed. From D. B. Murray re payment for day work on Westminster Av. Referred to Board of Works. From J. H. Carlisle pressing upon the Committee the necessity of at once purchasing a team for the Fire Department. Filed. The Board of Works met on Thursday Nov 14th 1889 and Monday Nov 18th 1889. Present Aldermen Brighouse, Brewer, Horne, McConnell and Oppenheimer. 1. That P. T. Johnston & Co’s offer to supply trees in lieu of cash retained by the Treasurer be accepted. 2. That Fountain No 52 be ordered from J. L. Mott, price F. O. B. New York $763.00. 3. That Messrs Boyd and Clandenning be allowed $81.00 for extras on Hastings St. east. 4. That there are no funds available for the construction of a concrete sidewalk on Cordova Street as petitioned for by Thos. Dunn & Co. et al. 5. That the freight duty and purchase money of the Sewer pipes be paid on arrival in order to obtain the discount. 6. That a rough shed and platform be erected for the construction of pipe joints and the storage of pipes and that cast iron boilers and a small furnace for heating the composition be placed therein. The City Engineer reports that a six ft. sidewalk from the end of the present sidewalk on Westminster Road to the North Arm Road would cost $144.00 and a three ft. one $84.00 with $25.00 extra in each case for clearing. As said Sidewalk would be outside the City Limits we have referred the matter back to Council for its decision thereon. Moved by Alderman Horne, seconded by Alderman Brewer. That the Report of the Board of Works be adopted. Carried. The Finance Committee met on Friday Nov 15th 1889. Present His Worship, the Mayor and Aldermen Clark, Costello and Whetham. 1. That we have examined into the charges made by the City Auditor in reference to burial certificates being issued without cash being paid on delivery and find that the City Clerk was justified under the circumstances for such issues in these particular cases. 2. That Thos. Andrews be allowed $25.00 for money in the case of one Morrison connected for supplying liquor to Indians. 3. That John Devine’s resignation as Auditor be accepted but that he be requested to finish his audit to the end of November. 4. That James D. Fraser’s communication asking for a return of his deposit be referred to the City Solicitor. 5. That Havelock Fyfe be paid to date of Notice of discharge in full settlement of his claim against the City for salary as Police Officers. 6. That John M. Stewart be allowed salary to date of Notice of discharge and that all amounts due the City from him be deducted therefrom. 7. That the question of the purchase of a fountain be further deferred. Moved by Alderman Costello, seconded by Clark. That clauses 5 and 6, relating to the salaries of H. Fyfe and J. M. Stewart be eliminated from the report. Carried. Moved by Alderman Costello, seconded by Alderman Clark. That the balance of the Report be adopted. Carried. The Fire, Water & Light Committee met on Friday November 15th 1889. Present Aldermen Brighouse, McConnell, Oppenheimer and Whetham. 3. That the consideration of the purchase of Household Fire Extinguishers be deferred for the present. 4. That Stephen Menard of Lookinglass, Oregon be communicated with in reference to the purchase of a team of horses for the Fire Department. 5. That the following Rules be adopted in addition to those now in force, for the government of the Fire Department under the head of penalties. (1) Disobedience of Orders (2) Being in a State of Intoxication (3) Insolence in word or manner (4) Violent or coarse language or behaviour (5) Entering hotels or saloons while on duty or houses of ill fame, unless in the discharge of duty as a fireman. 6. That Louis Eggert be discharged from the position of Fireman and that he be paid to date of discharge. (3) Westminster Avenue from the Bridge to Seventh Av. 9. That the Vancouver Water Works Co be paid for hydrants giving a pressure of 80 lbs or over on all accounts rendered to date. 10. That the Engine in Fire Hall No One be moved into the hose house and that stalls be erected for the horses in rear thereof. Moved by Alderman Brewer, seconded by Alderman McConnell. That the Fire, Water & Light Report be adopted. Carried. Moved by Alderman Horne, seconded by Alderman Costello. That fresh tenders be called for the construction of the Sewers such tenders to be received up to Thursday November 28th 1889. Carried. Moved by Alderman Clark, seconded by Alderman Horne. That permission be granted to the P. O. Department to erect P. O. Boxes in locations mentioned in E. H. Fletcher’s communication. Carried. Moved by Alderman McConnell, seconded by Alderman Mason. That the City Clerk call for tenders for the necessary Police Clothing. The same to be approved of by the Police Committee. Carried. Moved by Alderman McConnell, seconded by Alderman Brewer. That an application be made to Mr. Browning, Land Commissioner of the C. P. R. Co requesting him to grant to the Council the temporary use of a small piece of land on the Company’s Reserve opposite the South end of Abbott St. for the purpose of storing the sewer pipes and for the erection of a shed in which to make the composition joints, such piece of land not to exceed 150 feet square. Carried. $7,000 in total granted for public works to streets and sidewalks; projects grouped according to city ward. John Devine resigns as city auditor. Date, time and place for election of 1890 Mayor and Council determined. The Council met on Monday November 11th 1889 at 8 P. M.
Present His Worship the Mayor and Aldermen Brighouse, Clark, Costello, Horne, Mason, Oppenheimer and Whetham & McConnell. From F. C. Stover asking for a further extension of time for the erection of the Fire Alarm. Filed. From J. J. Blake advising Council that Thos. Andrews was entitled to half the money for fine under the Indian Act. Referred to Finance Committee. From J. M. Stewart asking settlement from the Council. Referred to City Solicitor & Finance. From Rev. James W. Pedley asking that a sidewalk be erected in the Vicinity of his new church. Referred to Board of Works. From Andrew J. Whitenack asking that Hastings Street in front of Lots 5 & 6 Block 66 Subdivision of 196 be graded. Referred to Board of Works. From John Devine resigning his position as City Auditor. Laid over. Cemetery. Referred to Finance Committee. From John Breuss & Co et al asking to be allowed certain privileges in connection with their Sausage business. Referred to Police Committee. From F. W. Hart asking that road to cemetery be repaired. Referred to the Board of Works. From James D. Fraser asking for a return of his gravel deposit. Referred to Finance Committee. From E. J. Curran et al asking that Westminster Road to the Junction of North Arm Road be sidewalked. Referred to the Board of Works. The Board of Health met on Monday November 11th 1889. Present Aldermen Whetham, Costello and Mason. 1. That the pump at the City Hospital be given to the Caretaker at the Cemetery. Moved by Alderman Oppenheimer, seconded by Alderman Brighouse. That the Report of the Board of Health be adopted. Carried. The Finance Committee met on Monday November 11th 1889. Present His Worship the Mayor and Aldermen Whetham, Clark, Costello and Mason, Aldermen Clark being appointed Chairman protem. That the Trustees of the Sinking Fund be instructed to furnish the Council with a detailed statement of said fund and the manner in which it is invested. to be devoted towards street improvements as per list furnished and dated Oct 22. 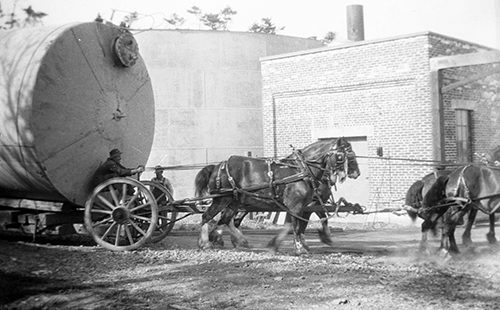 That the Report of the F. W. & L. Committee recommending the purchase of a team of horses and the Board of Works Report recommending the purchase of a fountain be laid over for one week. Sgd. R. Clark, Chairman pro tem. The Board of Works met on Monday November 11th 1889. Present Aldermen Brighouse, Horne & McConnell. 2. That the North Arm Road South of Granville Street Bridge within the City Limits be repaired and gravelled provided the C. P. R. Co. pays half the cost thereof. The following works were adopted by Council and included in the Board of Works Report on motion of Alderman Horne, seconded by Alderman McConnell. Pender St. 8′ sidewalk South Side from Burrard to Howe & continue old sidewalk on Pender. Seymour St. Old Granville St. sidewalk put between Davie & Drake on West side. Barclay St 3′ sidewalk Burrard to Bute South Side also One Block & Crossing on North Side. Homer St. crossings at North end crossing Cordova St.
Lane Block 11, 70, 71 plank 100 ft.
Finance granted $7,000.00 to cover above work. Moved by Alderman Horne, seconded by Alderman McConnell. That the report of the Board of Works be adopted. Carried. Moved by Alderman Brighouse, seconded by Alderman Clark. That a By-Law be introduced to fix time and polling places and appoint Deputy Returning Officers for holding an election for Mayor and Alderman for the year 1890 and read a first time. Carried. By-Law read a second time on motion of Alderman Clark seconded by Alderman Horne. The Council then went into Committee of the Whole with Alderman Clark in the Chair. In Committee the By-Law was read over clause by clause and reported back to Council as complete with amendments. The By-Law was then read a third time and ordered to be signed, sealed and gazetted. Moved by Alderman Clark, seconded by Alderman Horne. That the Auditor’s Reports and the By-Law appointing him be referred to the Finance Committee. Carried. Moved by Alderman McConnell, seconded by Alderman Horne. That the City Engineer be instructed to have part of the lane in Block Six, District Lot 196 planked with old plank. Carried. Moved by Alderman McConnell, seconded by Alderman Costello. That His Worship appoint two Aldermen on the Police Committee to act in place of Aldermen Horne and Salsbury. Carried. His Worship appointed Aldermen Costello and Whetham. Brockton Oval lease to Athletic Club and Eastern (Hastings Park) lease to Jockey Club both to be completed and signed. James MacDonald appointed pound keeper at a monthly salary of $35; he had to supply his own horse. Cost of $6 for burial of F. Robbin was approved. The Council met on Monday November 4th 1889. Present His Worship, Mayor Oppenheimer, Aldermen Brewer, Brighouse, Clark, Costello, Horne, Mason, McConnell, Oppenheimer and Whetham. From Goodmurphy and Abrams, asking for a refund of 6.00 paid in to the City for, a [sic] for F. Robbin. Filed. From Dr. Bodington asking for the payment of an account of $20.00. Referred to Finance Committee. From P. I. Johnston & Co offering to supply 71 Ash Trees in place of trees that have died. Referred to the Board of Works. From John Devine asking Council to seriously consider Section 170 of the City Charter re Investment of Sinking Fund. Referred to Finance Committee. From Thos. Andrews asking Council to refund to him $25.00 as Informant under that Indian Act. Referred to City Solicitor. From A. H. B. MacGowan Secretary of the Board of Trade urging Council to take Steps towards repairing the North Arm Road. Referred to Board of Works. From John Devine giving notice of his resignation as Auditor. In this connection Alderman Clark requested the City Clerk to furnish at next meeting of Council By-Law confirming his appointment and conditions of engagement together with all monthly reports since appointment. From H. T. Ceperley asking Council to have the bank at the South end of Westminster Avenue Bridge widened out and recapped, cost estimated at $40.00. Filed. From City Clerk of New Westminster inviting the Mayor and Council of Vancouver to be present at the reception of His Excellency the Governor General. Filed. From W. Myers et al asking Council to take steps towards removing the Slaughter Houses on the South Side of False Creek. Referred to the Board of Health. The Board of Works met on Thursday October 24th 1889. Present Aldermen Brighouse, Horne, McConnell and Oppenheimer. 1. That James McDonald be appointed Pound Keeper at a Salary of $35.00 per Month including all fees, he to furnish a horse. 2. That fountain plate No 52 Manufactured by J. L. Matt, New York be purchased, provided answer to telegram sent is favourable. Moved by Alderman Horne, seconded by Alderman Oppenheimer. That the Report of the Board of Works be adopted. Carried. Thos. Andrews et al $97.50 Carried. B. Hungerford et al $261.90 Carried. P. Atkinson et al $245.55 Carried. Moved by Alderman Costello, seconded by Alderman Oppenheimer. That a committee consisting of His Worship the Mayor and Aldermen Clark, Horne and Whetham meet a Committee of the Brockton Point Athletic Club and also a Committee of the B. C. Jockey Club to arrange terms of leases to those associations and to settle the manner in which the proceeds of the loan for the improvements of Brockton Point Athletic Grounds and the Race Course Grounds in the Eastern Park be expended, such arrangements to be approved of by Council. Carried. Moved by Alderman Oppenheimer, seconded by Alderman Costello. Resolved that a Memorial from this Council under the Seal of the Corporation and signed by the Mayor and City Clerk be forwarded to the Government of this Province asking it to introduce a measure at the next session to so amend Section 3 of Chapter III of the Consolidated Statutes of this Province as to exclude from its provisions the Several cities of the Province relating to personal property and income tax and that a copy of such Memorial be forwarded to the other cities of the Province asking their cooperation in the matter. Carried. Moved by Alderman Clark, seconded by Alderman Whetham. That the amount of $6.00 paid by John Abrams and C. Goodmurphy for Cemetery burial fees for the burial of F. Robbin be refunded therein. Carried. Moved by Alderman Horne, seconded by Alderman Whetham. That this Council accept with thanks the invitation of the Mayor and Council of the City of New Westminster to be present at the reception of His Excellency the Governor General at New Westminster on Nov 6th 1889. Carried. Moved by Alderman Oppenheimer, seconded by Alderman Whetham. That a sum not exceeding forty dollars be allowed to the Street Ry. Coy. to do work mentioned in their letter of November 4th 1889 under the Supervision of the City Engineer. Carried. Alderman Whetham gave notice that at next meeting of Council he would introduce a motion in reference to the Police Officials. Policemen regularly met in a restaurant when they were supposed to be on their beats. Chief Stewart cleared of intentional wrong-doing in some charges, but not all. His “total want of order and system” to blame for many irregularities. Constable Fyfe convicted of receiving regular monthly payments from two prostitutes, Miss Wee Hee and Miss Mary Sam. A Special Meeting of the Council was held on Saturday November 2nd 1889 for the purpose of considering the Reports of Hon Mr. Justice Drake on the Police Investigations. Present His Worship the Mayor and Aldermen Brewer, Brighouse, Clark, Costello, McConnell, Oppenheimer and Whetham. The following Reports were read. On the 10th of October 1889 and 4 following days I held an inquiry into certain charges brought against John Malcolm Stewart, Chief of Police in pursuance of a resolution of the Council of the Corporation of the City of Vancouver under Section 212 of the Vancouver Incorporation Act. The charges were 45 in number, of these charges 10, 12, 17, 19, 20, 20a, 21, 24 & 25 were not proceeded with and charges 1, 6, 14, 19, 22, 26, 29, 32, 33, 36, & 40 were explained and arose apparently from want of accuracy in keeping the books which were produced on this inquiry, while charges 38, 39 42 & 43 were explained by Mr. Blake, the City Solicitor, stating that Stewart acted under his instructions and advice. received but the total want of system and management conspicuous in the whole of this inquiry is accountable for this apparent dereliction of duty. Charge 7, AL. Sing 3.00 ordered for costs was paid to the interpreter by Stewart. With respect to charges 2, 16 & 23 they all arose under the Indian Act and fines were imposed by the Police Magistrate and one half of the fines were retained by Stewart as prosecutor. the remainder of the money of the penalty went into Stewarts hands and was retained by him. There was evidence of great irregularity in all these cases. John Clough in charge 2 (John Morgan) denied having signed the information also his mark is attached to the one produced and, in charge 23, (John Terre) an information was produced with receipt endorsed, signed with John Clough’s mark but he denied all knowledge of it. No evidence was adduced to satisfy me, that Clough did lay the information in charge 2 and in charge 23, no evidence was adduced to prove he signed the alleged receipt. It is to be regretted that none of the records of the Court in any of these cases were produced and I was informed by the Police Magistrate that it was not the custom to take down the testimony of witnesses in these or any other cases coming before him except in the case of indictable offences and the Magistrate’s book does not show who laid the information or what (if any) witnesses were called. I therefore am driven to the conclusion that Stewart received the monies in these cases less the small sums paid to Clough. The Indian Act allows the money of fines in all cases of this character to be paid to the prosecutor or informant and if it was not for the contract put in evidence, it might be a nice question to decide who would be entitled to the money the person who prosecutes or the person first giving the information to the Police authorities. With respect to charge 3, I find the Police Magistrate, ordered certain spirits to be destroyed and it is so entered in his books as well, as Stewart’s book but Stewart contrary to the order of the Magistrate sold the spirits and realized $47.00, $25.00 of which he alleges he paid out for the hiring of a tug and $20.00 to the 2 Police Officers who assisted him in the capture. I now come to charges 13, 15, 34 & 41 in each of these cases the persons charged were sentenced to imprisonment for varying terms and were committed to the Lock-up but were each discharged before the expiration of their sentence. No explanation was afforded to me of the reasons of their discharge or by whose authority it was done, the records kept by the gaoler do not show anything beyond the bare fact that these persons only served a portion of their sentence and Stewart professed entire ignorance of any one of the cases brought forward. As regards charges 25, 27 & 28 each of these cases arose from a want of care in Stewart not taking down the Sentence of the Court correctly and neglecting to compare his book with the Magistrates notes. I do not find anything beyond a mistake which was caused by the want of System to which I have before referred, this disposes of all the charges brought against Stewart. business is conducted is so generally expressed. The Police Magistrate by his own admission shows that he has not taken the trouble to make himself acquainted with the provisions of the Statutes under which he is called upon to exercise jurisdiction and even when he has exercised his jurisdiction and even where has he exercised his jurisdiction, the City Solicitor appears in some instances to have given directions not to carry out the orders of the Court. Such a course of proceedings renders the administration of Justice, difficult if not impossible. The Chief of the Police is the executive officer for the purpose of enforcing the sentence of the Police Court; he however appears to have acted independently of the Magistrate, to have varied his sentences and exercised his own discretion in enforcing them, several of the instances however may have arisen from a mistake or misapprehension on his part; because he states he hardly ever compared his notes of the judgment rendered with the Magistrates book. It is essential that care should be taken that the sentence is correctly recorded and correctly executed. Mr. Stewart and the other police officers examined all admit that they have not complied or attempted to comply with the regulations issued by the Police Commissioners, if they had done so many of the charges now brought forward could not have had any existence. If any of the regulations hereafter should be found inappropriate they can be altered but unless they or similar rules are enforced the same confusion which now exists must arise. authorized to receive these monies irregularities are sure to arise. No prisoner should be discharged before his sentence has expired without the written authority of the Police Magistrate and the reasons for such discharge given, in the cases under inquiry money may have been paid to the Gaoler or the Chief for their discharge but there is no evidence of such being the fact but the system hitherto in vague renders such a suspicion not unreasonable. In cases where a prisoner is sent to a provincial Gaol, a receipt should be given in order to discharge the Gaoler from responsibility. It was also proved that the Police Officers on night duty were accustomed to meet at a restaurant and take their meals during the time they were supposed to be on their beats and this was done without any orders from the Chief; it is obvious that such a proceeding must be subversive of all discipline and some arrangements ought to be made to avoid the necessity of the officers taking meals while on duty. I have touched upon the chief points brought out on this inquiry and trust they may be of service to the Corporation. Sgd. M. W. Tyrewhitt, Drake. In the case of Officer Havelock Fyfe charged with accepting bribes from Chinese Prostitutes since January 1888 and from Mary Sam since September 1888.
had paid a monthly sum on or about the first of each month commencing 12 months ago, at first $5 a month and afterwards $8 a month, so that the Police would not interfere with her. Her testimony was corroborated by another witness named Chock who was present on two occasions when money was paid by Wee Kee to Fyfe. It was admitted that this woman’s residence was in the beat of Officer Fyfe and that he had, for the last two years, been in charge of this central beat and no complaints had ever been lodged against this woman or the house she occupied. Chinese testimony is not the most satisfactory but in charges of this description it would be impossible to get any other and as I can see no ulterior motive actuating these witnesses I consider the charge proved. The other case of Mary Sam is of the same character, but there is no corroborative evidence and if it stood alone I should be inclined to give the Officer the benefit of “not proven” but taken in connection with the other charge I am of opinion that the officer did receive money in order to protect the houses occupied by these women from Police interference. I submit the evidence and documents put in as exhibits. 17th Oct 1889. (Sgd.) M. W. Tyrewhitt Drake J.
have consulted the Police Magistrate but as he took the advice of the City Solicitor and having taken his advice and acted on it in good faith, consider that on those particular charges he be exonerated from any wilful breach of duty. Carried. Moved by Alderman McConnell, seconded by Alderman Whetham. That the Chief of Police displayed gross neglect of duty in not paying the money in promptly according to the By-Laws of the City on charges No’s 4, 5, 7, 8, 9, 18, 30, 31, 37 & 44 and that he be requested to pay same forthwith to the City Treasurer. Carried. Moved by Alderman Clark, seconded by Alderman Costello. That charges 2, 16, & 23 under the Indian Act but consider that Stewart committed a grave breach of trust and violation of existing contract with the City and that all the monies received in those particular cases be immediately refunded to the City Treasurer. Carried. Moved by Alderman Brewer, seconded by Alderman Brighouse. In charges 13, 15, 34, & 41 we find that there was wilful neglect of duty in allowing prisoners to be released before the expiry of their sentences. Carried. days in those charges. Carried. Moved by Alderman McConnell, seconded by Alderman Brewer. In charges 3, the Chief of Police exceeded his authority in selling the liquor and paying expenses out of the proceeds contrary to the decision of the Magistrate. Carried. Moved by Alderman Oppenheimer, seconded by Alderman Brewer. That Chief Stewart’s services be dispensed with and a general re-construction of the Department inaugurated. Carried. Moved by Alderman Brighouse, seconded by Alderman Brewer. That Havelock Fyfe’s services as Police constable be dispensed with. Carried. Moved by Alderman Oppenheimer, seconded by Alderman Clark. That the recommendations of Mr. Justice Drake be carried into effect. Carried. Moved by Alderman McConnell, seconded by Alderman Brighouse. That the press be allowed all papers in connection with the Police Investigation for publication. Carried. Alderman McConnell to select a team of horses to be purchased for the Fire Department. An electric light to be installed in the Fire Inspector’s office. The Council met on Monday, October 21st 1889 at 5 P.M. Present His Worship the Mayor, Aldermen Brewer, Brighouse, Costello, Horne, Mason, McConnell, Oppenheimer, Salsbury and Whetham. From E. J. Curran et al praying Council to improve Westminster Road from the City Boundary to the Junction. Referred to Board of Works. From Angus McAlister e tal praying Council to grade and sidewalk Seymour Street from Drake to Davie Streets. Referred to Board of Works. From John P. Lawson, City Engineer and Street Railway Co. on the Subject of the Westminster Avenue Bridge. Filed. From F. C. Innes enclosing an account for Street Works. Referred to Board of Works. From A. J. Monat Secy. Treas. of Vancouver Free Reading Room requesting Council to make a further grant in aid of the Library. Referred to Finance Committee. The Finance Committee met on Friday October 18th 1889. Present His Worship, the Mayor and Aldermen Salsbury, Clark and Costello. 2. That the Report of the Board of Works read at last meeting of Council be confirmed. Moved by Alderman Brighouse, seconded by Alderman Brewer. That the Report of the Finance Committee be adopted. Carried. The Fire, Water & Light Committee met on Wednesday, October 16th 1889. Present Aldermen Clark, McConnell and Oppenheimer. 2. That an electric light be placed in the Fire Inspector’s Office. 3. That the Chairman of this Committee be authorized to arrange for installing sufficient electric lights in Fire Hall No. 1 and report. 4. That a team of horses be purchased for the Fire Department and that Alderman McConnell be authorized to select same, such selection to be approved of by this Committee. 5. That a Saddle be purchased for the Fire Department and a shed erected and blacksmith’s tools purchased as recommended by the Chief of the Brigade. Moved by Alderman Horne, seconded by Alderman Brewer. That the Street Railway Co be granted the privilege of widening the present Westminster Avenue Bridge across False Creek; twelve feet on the West Side under the Supervision of the City Engineer at a cost not exceeding fifteen hundred dollars, the City to pay one half the cost to the Railway Co. and the Railway Company the other half. The addition so constructed to be devoted exclusively to the use of the Street Railway Co. except such lines as repairs to the present bridge should render the use of the said addition necessary for the public and that the Agreement with the St. Ry. Co. be amended accordingly by the City Solicitor and reported to this Council subject to the Charter. Carried. Alderman Salsbury gave notice that at the next regular meeting of the Council he would introduce a By-Law to fix a price to offer for the works of the Vancouver Water Works Co. under the provisions of subsection 5, subhead “l” of Section 142 of the Vancouver Incorporation Act 1886.